One can use a NAS in so many different areas that a report about all purposes would be enormous and enormously time-consuming. I will limit myself here to the "simple" user and the area "Multimedia-Home-NAS". There will be overlaps between them, but basically I am not referring to the professional area. This includes e.g. the integration into a domain, as well as DNS and DHCP server as a purpose of the system. Also the Fabulous Surveillance Station I will mention here only in the introduction. 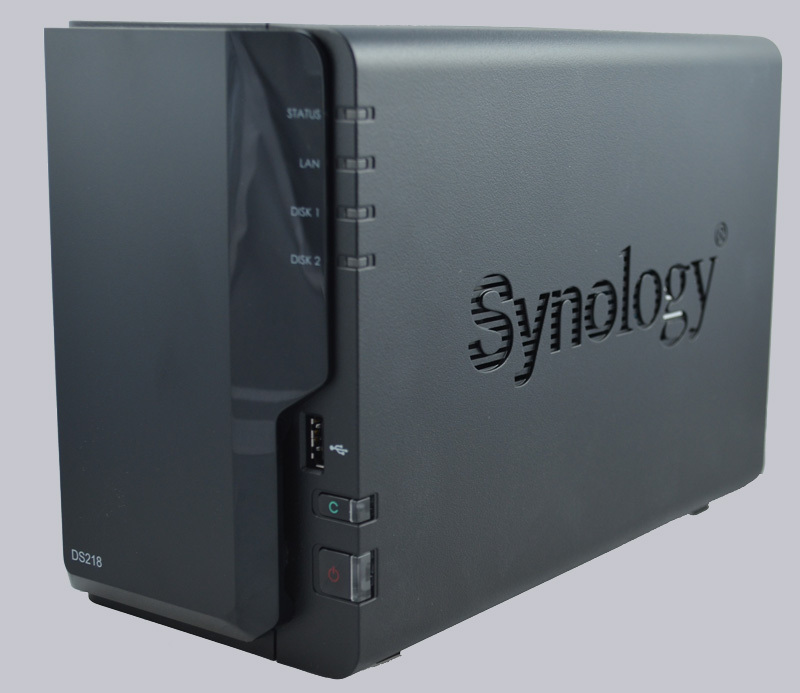 The systems of Synology are separated into 4 series. The J series is the entry-level class, the Value series is the mainstream class, the Plus series is for the slightly more demanding tasks and the FS & XS series goes into the professional and server area. I received the model DS218 from the Value series. If you compare the DS218j, DS218 and DS218+ models, you will find differences in the CPU models, the RAM, the possibility to expand the RAM and the existing connection options. This of course also results in variations in different areas of the software, e.g. the number of users or the maximum number of simultaneously possible connections. 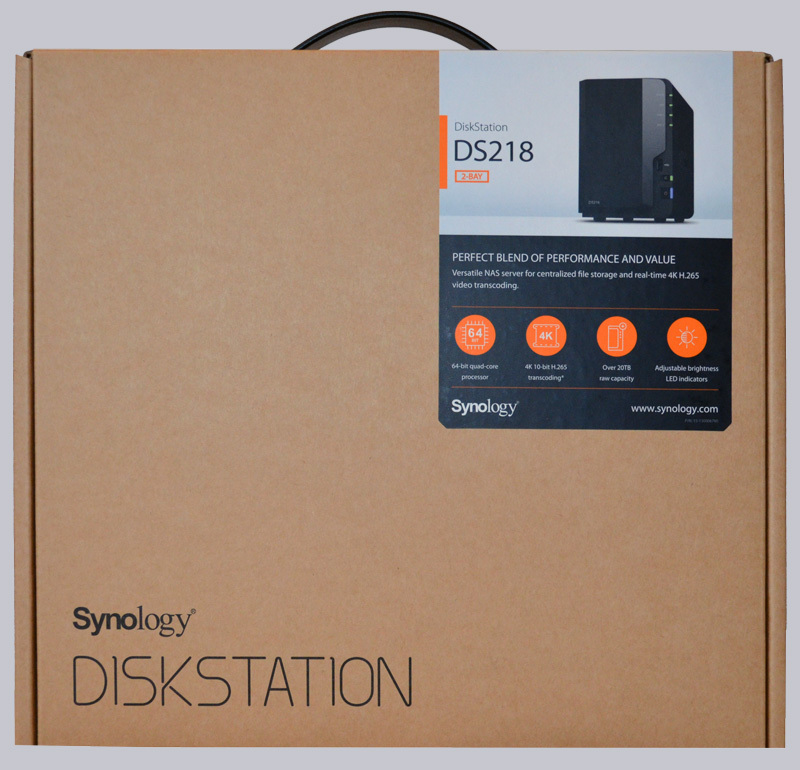 The Synology DiskStation DS218 comes in a plain brown cardboard box, which still doesn't look cheap. It also makes a high-quality impression when the carton is opened. 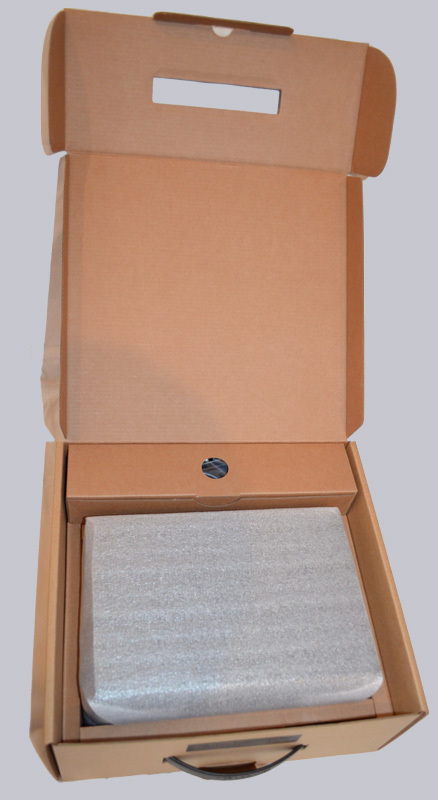 The system is neatly wrapped in a white plastic sleeve in the lower centre of the packaging. Above is the accessory, which consists of the power supply, a LAN cable (1.8m CAT-5), the Quick Installation Guide and the screws for the 2.5 inch drives. Additionally I was provided with two 2TB Seagate NAS IronWolf hard disks. At first glance, it is obvious that the case is made of plastic and not metal, which doesn't harm the look here either. I also think it's excellent that only a very small surface is shiny and the rest is nice matt black. The processing is clean and high quality. 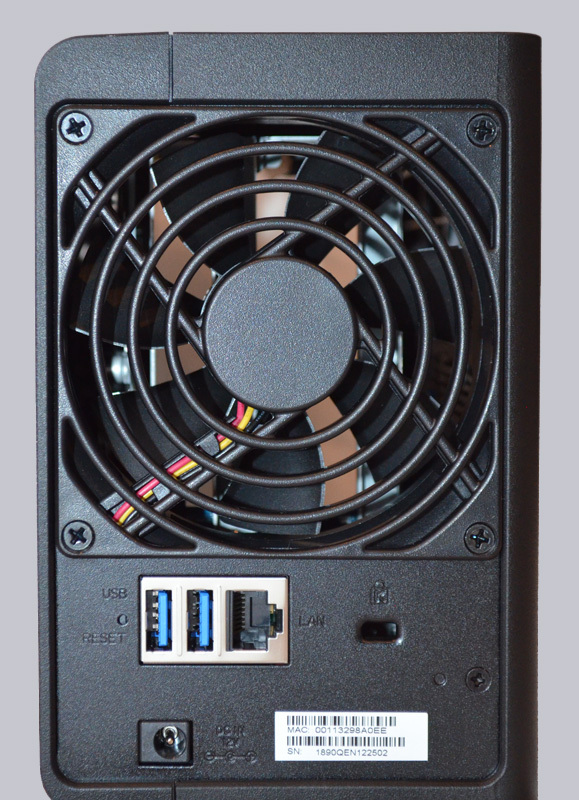 On the back there is a 1GbE LAN port, 2 USB 3.0 ports, the reset button, the power port and a Kensington security port, but it is dominated by a 9cm fan. On the front there is a USB 2.0 socket, the power button, the copy button and the status LEDs, as well as the two drive bays incl. slide and front panel. The DS218 incorporates a Realtek RTD1296 quad-core processor with 64-bit architecture and 1.4GHz. As it's typical for the Value series, the 2GB DDR4 RAM are unfortunately not expandable. A maximum of 4K (4096 x 2160) resolution at max. 60 FPS can be displayed. The CPU can also transcode 10-bit H265, MPEG-4 Part 2, MPEG-2 and VC-1 hardware. There are 2 hot-swappable drive bays available, which can hold 2.5 inch as well as 3.5 hard disks or SSDs with SATA interface, whereby the maximum capacity can be 14TB each. Internally Brtfs and EXT4 are supported, external drives can be formatted with Btrfs, EXT3 & 4, FAT, NTFS or the Apple file system HFS+. If you also want to connect data carriers formatted in exFAT, you can download the exFAT Access for 3.99 USD in the package center. The 2TB Seagate IronWolf rotates at 5900rpm and has 64MB cache. Only the models from 4TB have the rotational vibration sensors and an interface for the IronWolf Health Management. The sensors measure the vibrations generated by the spindles and allow the individual drives to run safely. I think the design is chic, in spite of the solid plastic housing. Matt black with only a small part of shiny front panel. 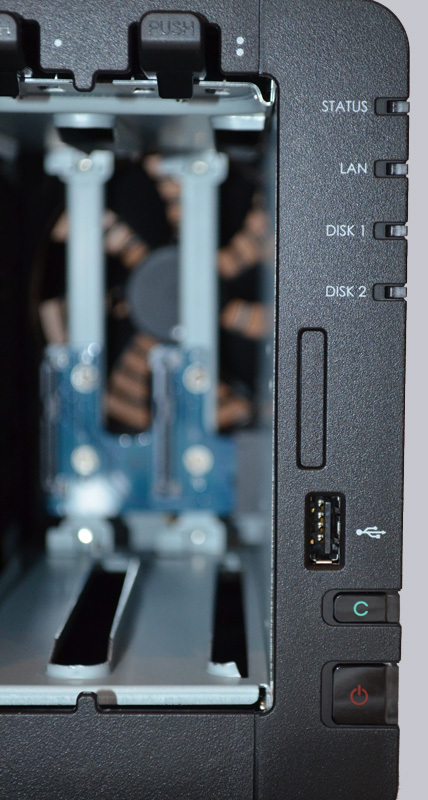 The front panel hides the view of the open drive bays, but additionally reduces their vibrations, because it is clamped between the drive slides with rubber buffers. The company name is embedded in both sides as a large lettering and at the same time serves as ventilation. The completely tool-free mounting of 3.5 inch drives was a great solution. The slides consist of 3 parts, which can be easily clipped apart. The carrier plate is equipped with rubber buffers, which decouples the hard disks. 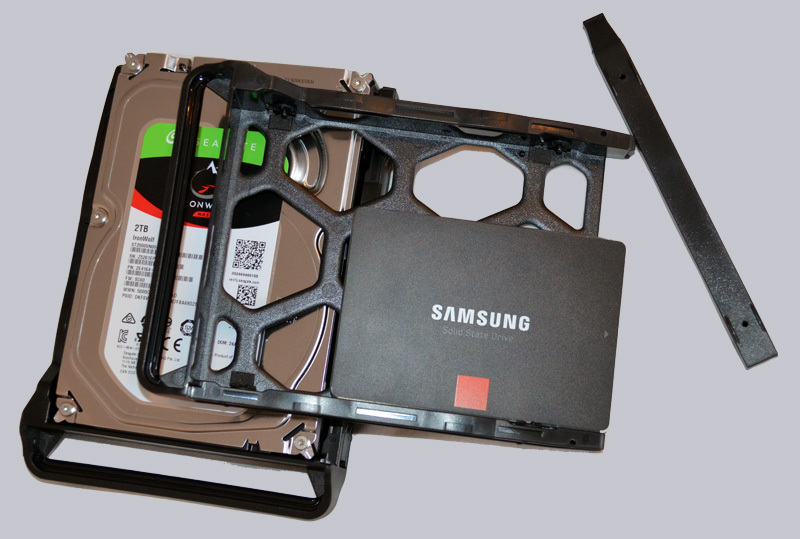 Once you have inserted the HDD, you put the two side parts back on again and everything sits neatly tight. When installing 2.5 inch drives I unfortunately had to notice that the left side panel had to be removed because it is pushed out by the drive. This is a bit of a pity as you are forced to keep the spare part somewhere in the hope that it doesn't mysteriously disappear. Otherwise, not much is needed, LAN cable and power connection are sufficient. I think it's a shame that only a slow USB 2.0 socket was installed on the front, because it is used as an interface for the copy key. The fast USB 3.0 ports are located on the back, so they can be difficult or not used at all, at least in my setup, and are not available for the one-touch copy function anyway. The NAS will be found about 1:15 minutes after pressing the power button in the browser and you can start setting it up. This can be done easily and quickly by hand. The first step is to define the name of the server, a user name and a password. Then you set the update to manual or automatic, including several options for time adjustment. 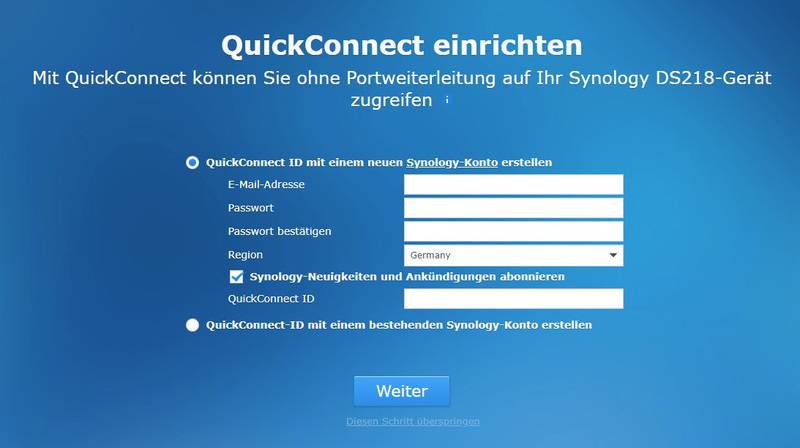 Then you can connect the NAS directly to Quickconnect, which requires a Synology account. The latest DSM will be downloaded and installed. After that a restart will be done again. But in less than 15 minutes after switching on, the system is completely finished and ready for operation. But here came the first damper for me. You are not asked during the setup how the hard disks should be divided. They are automatically configured in the SHR (Synology Hybrid Raid) with a disk fault tolerance and this cannot be changed afterwards. So if you want to use both plates, e.g. as JBOD, you can only install one plate at the first setup and add the 2nd one later! This is better solved with QNAP. The user interface of the in-house operating system DSM is tidy and the links of the programs can be easily created and sorted on the desktop. All programs, which are not available in the standard version, can be easily installed from the package center. All important programs and functions are available here, e.g. Hyper Backup, a free program for backup tasks. 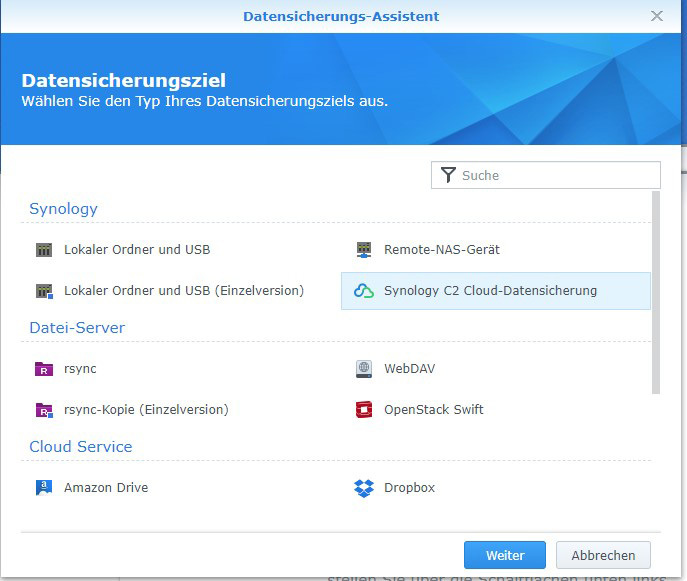 Hyper Backup also provides access to online backup destinations, including Synology's own cloud service Synology C2 Backup, whose data center is located in Frankfurt am Main, Germany and can therefore also be used for securing sensitive data for companies in accordance with the new DSGVO. The prices are also humane, so you get 1TB storage for 6€ per month. The data is transmitted securely via SLL encryption and you also have the option of protecting your data from transmission with a strong AES-256 encryption. The setup is problem-free and the connection is fast and reliable. 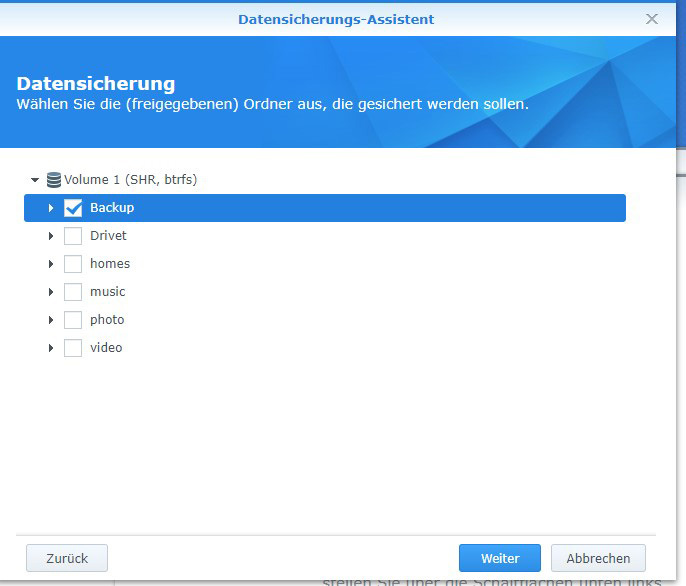 In addition to directories and files, you can also back up individual applications. A great function. All backups can be viewed and opened via the browser in the C2 Portal. If the NAS fails once, or if you are on the road and have no access to it, you can also retrieve the data from the portal. Due to the many installable extensions, the system can not only be used as a file or media center, but can also be used to host your own website or a mail server. A network drive can also be set up directly, folders are already available, e.g. video, photo, music. 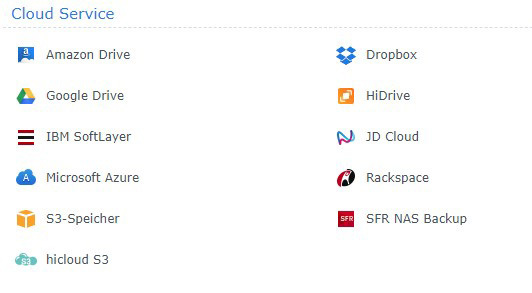 If you place files in these folders, they are automatically indexed as the respective medium and made available in the media library either for UPnP devices or for the Synology Apps. In the Video Station, however, you should be a little careful with the automatic search for cover pages and information about the movies or series. After I had added the children's series "Bibi Blocksberg", I was very surprised that it was recognized as different movies. One feature I could not successfully test is the trans encoding of 4k films. Currently I don't own 4k films, so I got several demos from the internet and added them to the media library. As described in the manual, I used the DS video app on the PC and on the tablet for playback. Unfortunately the movies were only shown very jerky. Since I'm not active in this topic, I don't know if it was the film material or wrong settings. All I can say here is that just copying it in and watching it didn't work. If the NAS should also be used as a file server, it doesn't matter whether NFS or iSCSI drives are used, both are quickly created. The NFS drives are created as shared folders in the Control Panel and then get their settings via the extended NFS permissions. Setting up an iSCSI connection is done via the iSCSI Manager. 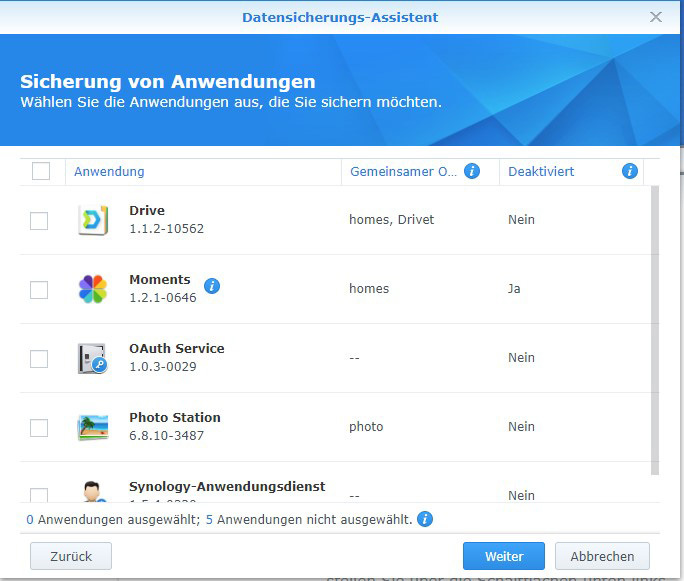 Synology also has the ability to create snapshots on the LUN, or VAAI and ODX for example. ... and a TS-431p2 (2GB RAM) from QNAP. A test folder with about 11,000 files and a size of 14.3GB copied all systems in about 2 minutes and 13 seconds. 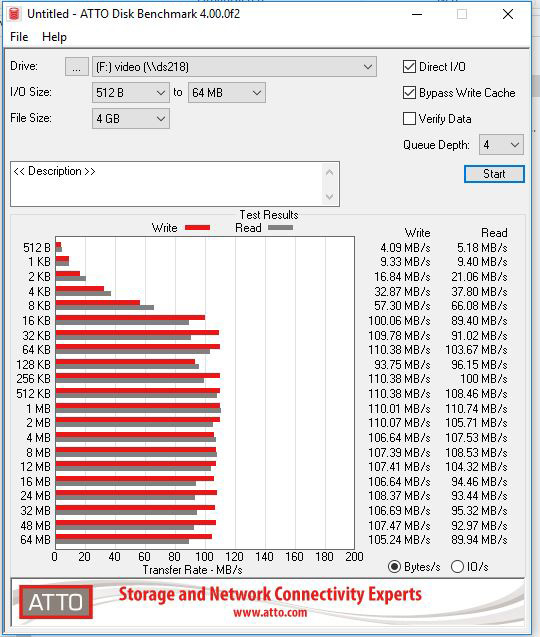 Sequential reading was between 106 and 111MB/s, while writing was between 115.6 and 116.3MB/s. The number of files copied was about 2 minutes and 13 seconds. Actually, one can say all perforated equally well. In the 4KiB area, Synology was even well above the QNAPs in some cases. 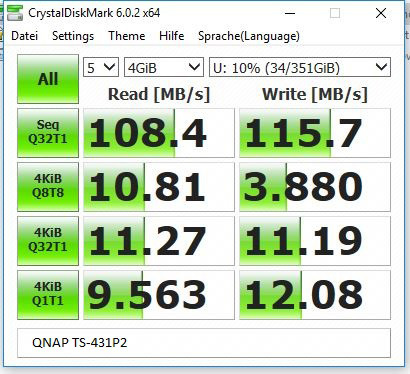 Here I would like to mention that the test of the DS218 and the TS-431P2 was done with the Seagate Ironwolf 2TB drives, the TS-453A used 4 3TB Western Digital RED. There is a big disadvantage if you want to use the front USB port. Unfortunately it only has the USB2.0 standard. I myself don't use the copy button provided, but I do connect a USB stick or an external hard disk from time to time if I don't want to run the data traffic through the PC. I copied one of my Steam Libraries to an external USB3.0 SSD for testing purposes. The amount of data in Windows was 15.6GB with 34,037 files, in 2305 folders. 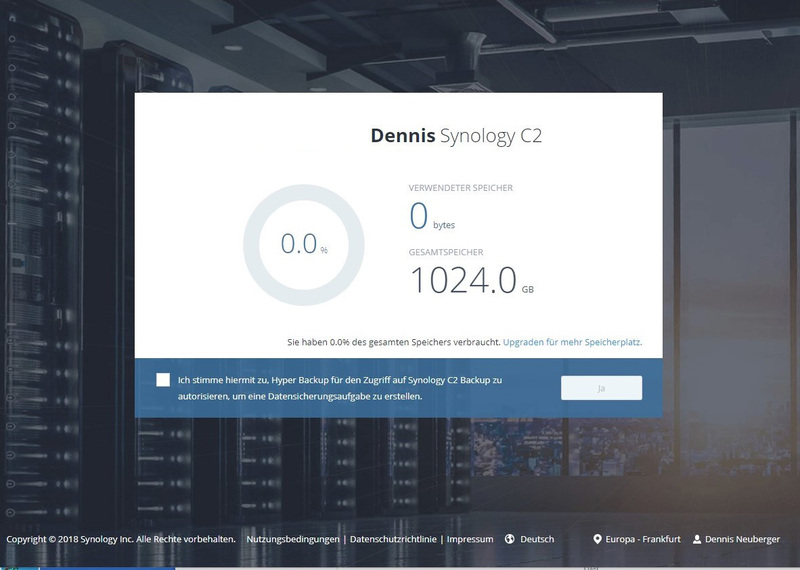 With QNAP the job is set via the app Hybrid Backup Sync, with Synology via USB Copy. Both systems were started in Copy mode. The result for the DS218 was a meager 19:14 minutes. The TS-453A did the job in 1 minute and 55 seconds and the TS-431p2 even in 1:42. 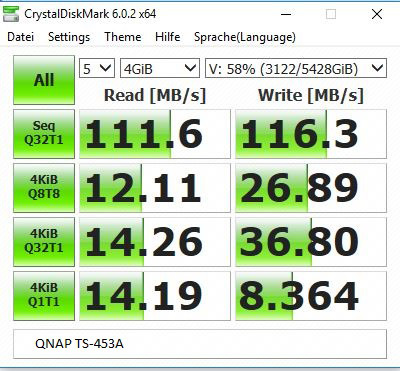 Of course the QNAPs benefit from USB3.0! The fact that the rear ports offer all USB3.0 is not really relevant for me, because the DiskStation is placed in such a way that I can't get to it and can only get to the rear ports by carefully pulling it out. One way to use them anyway would be to put a USB3.0 extension to the front. It is interesting to note that the copy jobs of all systems did not include all files, but only 9.6GB with 29472 files and 2169 folders. I never noticed the volume of the fan, but I also have 2 large aquariums in the room. But there are no grinding noises or loud air currents to hear. Another positive thing is that you can dim the LEDs at the front and even switch them off completely, even by timer. 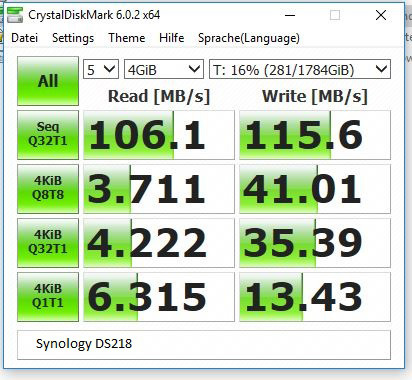 The Synology DS218 NAS is fast and powerful! The apps are working and easy to set up. The initial setup of the system is very easy even for beginners and is really done super fast. Synology Media Management works better than QNAP. 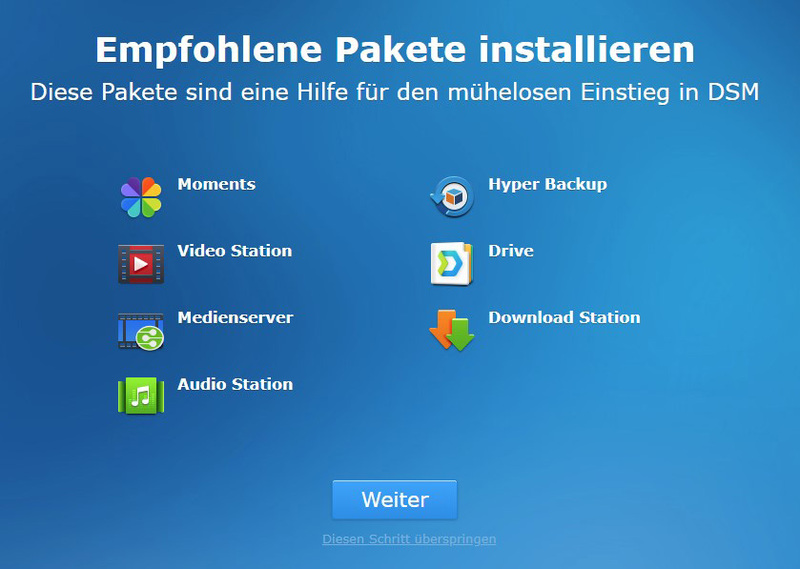 With QNAP I often had problems accessing the media via Android Tablet or Smart-TV. All in all I enjoyed the test and also the setup and playing around with the DSM surprised me positively. But it's the little things that let me personally continue to use QNAP. The main reason is certainly that Synology doesn't master IFTT, which is a pity. There is an Alexa skill for the audio station, but the commands are long, only in English and cumbersome. Otherwise, it's more like getting used to. With QNAP I already know where to "reach", with Synology I have to search. 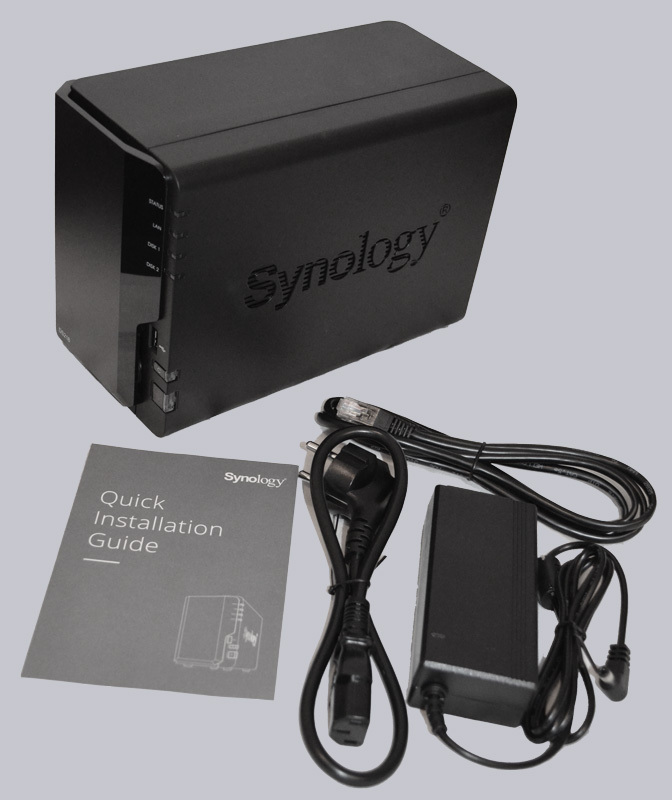 Here you can order the Synology DS218 at a reasonable price. 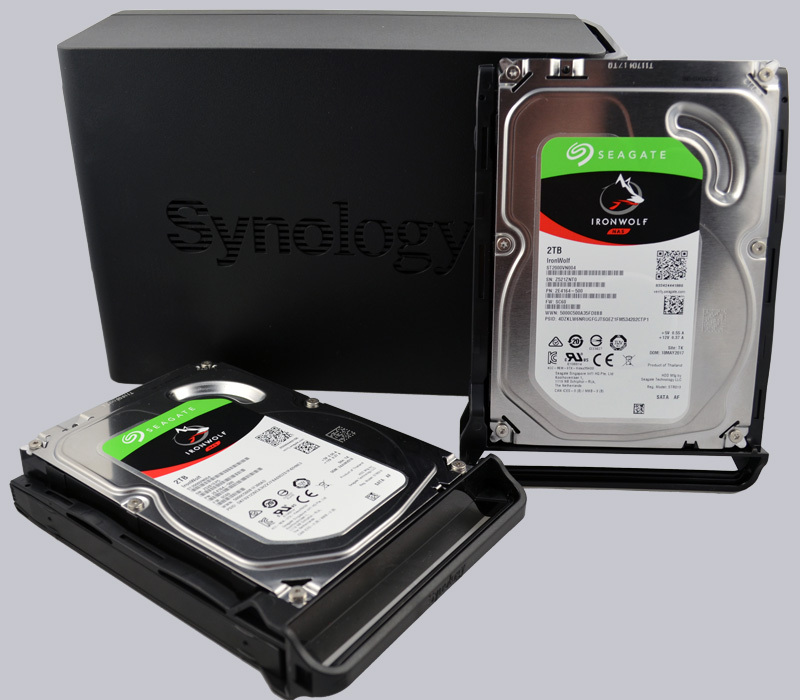 I wish you lots of fun with your new NAS system from Synology and the two 2TB hard drives that Seagate kindly provided.